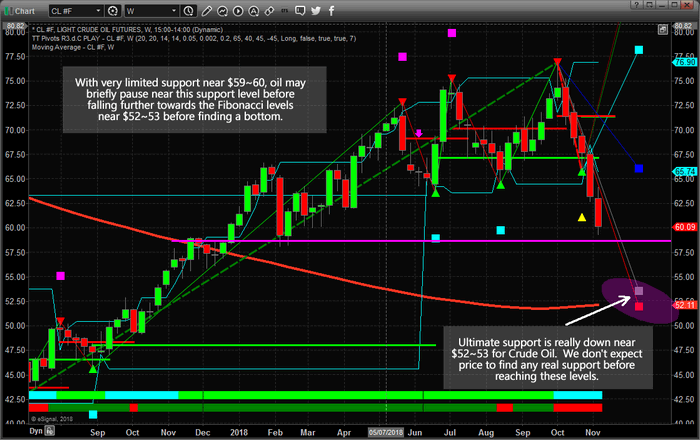 Will Crude Oil Price Find Support Near $60? Our research team warned of this move in Crude Oil back on October 7, 2018. At that time, we warned that Oil may follow a historical price pattern, moving dramatically lower and that lows near $65 may become the ultimate bottom for that move. Here we are with a price below that level and many are asking “where will it go from here?”. We believe the support near $65, although clearly broken, may eventually become resistance for a future upside price move. Our proprietary Fibonacci price modeling system is suggesting a new target near $52~53 and we believe this downside move in Oil is far from over at this point. The current global climate for Oil is that suppliers are pumping more and more oil into the market at a time when, historically, prices should continue to decline. One of our research tools includes the ability to identify overall bias models for each week, month or quarter. Historically, Oil is dramatically weaker in the month of November and relatively flat for the month of December. We believe the price of oil will continue to drift lower to target the $52~53 Fibonacci support level before attempting to find any real price support. This equates to an addition -6 to -8% price decline for skilled traders. We will alert you with a new research post as this downward price move continues or new research becomes available. We have been calling these types of market moves all year and recently called the top in the US Equity markets nearly 40 days before it happened. Want to know what we think is going to happen for the rest of 2018 and into early 2019? Visit www.TheTechnicalTraders.com/FreeResearch/ to read all of our public research posts. Isn’t it time you invested in a team of researchers and tools to assist you in finding greater trading success?